The Royal Society for the Prevention of Accidents (RoSPA) is a British charity which aims to save lives and prevent life-changing injuries which occur as a result of accidents. In the past it has successfully campaigned on issues of road safety, including playing an integral role in the introduction of drink-drive legislation, the compulsory wearing of seatbelts and the ban on handheld mobile phones while driving, as well as on issues of occupational health and safety. The origins of RoSPA date to the First World War when, in response to the 'alarming increase in road accidents' during the blackouts, the London 'Safety First' Council was established on 1 Dec 1916. In 1917, accident data were collected, there was a call to license all drivers, three children's safety competitions were run (involving 57,000 pupils) and a railway safety committee was established. A campaign to change the pedestrian rule so that walkers face oncoming traffic was so successful that fatal accidents caused by pedestrians stepping into the path of vehicles fell by 70 per cent in 12 months. Also in 1917 a separate body, the Industrial "Safety First" Committee was established, and as a result in 1918 the British Industrial "Safety First" Association (BISFA) was formed to tackle workplace safety on a national scale. In 1920, HRH the Duke of York became President of the London "Safety First" Council, when his presidency ended in 1923 he became Patron. Also in 1923 The National "Safety First" Association was formed with the London "Safety First" Council and BISFA affiliated to it. The Duke of York became Patron of The National "Safety First" Association in 1926. In 1932 the National "Safety First" Association extended its activities to Home Safety, and Caroline Haslett, director of the Electrical Association for Women, was appointed as chair of Home Safety Committee, a post she held until 1936, becoming the first woman vice president in 1937. In 1936 the Duke of York became King George VI and continued as Patron of the Association. 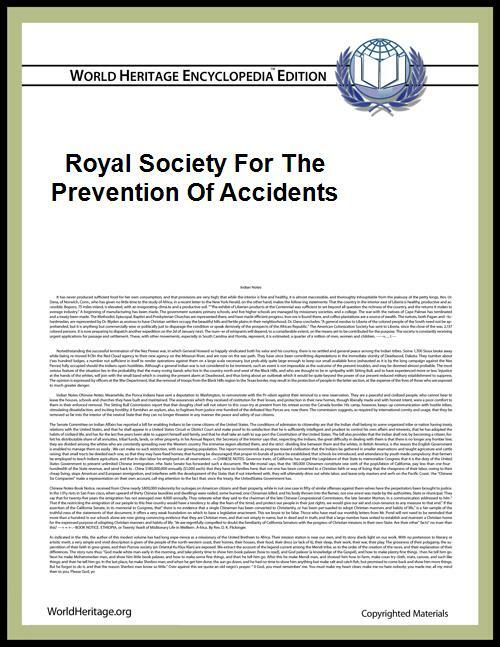 In 1941, with the agreement of the King, the Association changed its name to the Royal Society for the Prevention of Accidents - as it is known today. RoSPA's work concerns safety on the road (the organisation estimates that 550,000 people have died on Britain's roads since Bridget Driscoll's death in 1896. ), at work, in the home, at leisure, on and in the water as well as safety education for the young. RoSPA is governed by an executive committee and board of Trustees. The organisation employs approximately 120 staff, located in the head office in Birmingham and at regional offices in Edinburgh, Cardiff and Belfast. The Society's patron is Her Majesty the Queen. The Cycling Proficiency Test was created by RoSPA in 1947 as a minimum recommended standard for cycling on British roads. The National Cycling Proficiency Scheme was introduced by the Government in 1958, with statutory responsibility for road safety being given to local authorities in 1974, including the provision of child cyclist training but the scheme continued to be associated with RoSPA. The scheme was superseded by the National Standards for Cycle Training, branded Bikeability in England. ^ "Success Stories - RoSPA". RoSPA. ^ "RoSPA History : The Early Years". RoSPA. Retrieved 12 July 2013. ^ "RoSPA in the Twenties". RoSPA. Retrieved 12 July 2013. ^ "How the UK's first fatal car accident unfolded". BBC News. 17 August 2010. Retrieved 17 August 2010.